30 Year old Brandon Baskin was arrested and charged with his 4th DUI after being pulled over for not having his headlights turned on while driving at 10:00 at night. Baskin was stopped in the area of North Walnut Street near St. Clair Street. When police questioned Baskin, they noted in a report that his speech was "very slurred" and he was "very off balance while standing." When questioned, the man reportedly told officers that he was heading home after making a stop at Pinnacle Bank. He later changed his story and said that he just left a local bar, according to a police report. 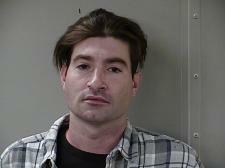 Baskin was eventually handcuffed and taken to the Rutherford County Adult Detention Center. The report shows that in addition to being charged with his 4th DUI, he was also charged with being an Habitual Offender and Driving on a Revoked License. Baskin will head to court on December 14, 2017.